Looking for IBM InfoPrint Color 1834 Parts? All models include one 550-sheet drawer, and a 100-sheet multipurpose feeder (MPF). Optional 550-sheet drawers and a 2,000-sheet drawer are available. Maximum input capacity is 3,750 sheets. Output capacity for all models is 300 sheets. All models have one slot for additional SDRAM memory. Memory options for the printer include 256 MB, 512 MB, or 1024 MB memory DIMMs. All models have one slot for flash memory with a 256 MB flash memory option available. 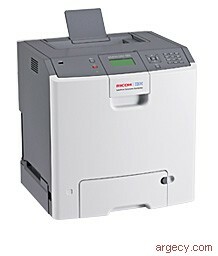 The wireless models and internal wireless feature allows the printer to be connected directly to a wireless LAN. This supports the IEEE 802.11b, 802.11g, and 802.11n draft 2.0 standards. Draft 2.0 refers to the version of the not-yet-ratified IEEE 802.11n standard. The maximum monthly usage for the InfoPrint Color 1834 is 85,000 impressions. InfoPrint Solutions Company does not recommend printing to the monthly maximum on a consistent basis. InfoPrint Color 1834 has five toner darkness levels for color and monochrome. The default setting is level 4. When printing in color, level 5 is equal to level 4. Refer to the table below. Additional fonts can be downloaded to the printer RAM, optional flash card, or hard disk. PCL emulation supports both scalable and bitmapped downloadable fonts. PostScript emulation supports only downloadable scalable fonts. Included on the CD-ROM shipped with the printer are screen fonts to match the printer's resident scalable fonts. The CD also includes downloadable fonts for Hebrew and Arabic. This will be available in the following languages: Arabic, English, Danish, Dutch, Finnish, French, German, Hebrew, Italian, Korean, Norwegian, Polish, Brazilian Portuguese, Romanian, Russian, Spanish, Swedish, Japanese, Simplified Chinese, Traditional Chinese, and Turkish. These will be available in the following languages: Arabic, English, Danish, Dutch, Finnish, French, German, Hebrew, Italian, Korean, Norwegian, Polish, Brazilian Portuguese, Romanian, Russian, Spanish, Swedish, Japanese, Simplified Chinese, Traditional Chinese, and Turkish. This will be available in the following languages: Danish, Dutch, English, Finnish, French, German, Italian, Norwegian, Polish, Brazilian Portuguese, Russian, Spanish, Swedish, Turkish, Simplified Chinese, Traditional Chinese, Korean, and Japanese. 2 In some cases performance specifications (such as paper OCF, EP cartridge usage) are specified to be measured at an ambient condition. Two new operating modes are implemented, Eco Mode and Quiet Mode. The Eco Mode optimizes printer settings to minimize the environmental impact while Quiet Mode significantly reduces acoustics. Settings or parameters that were changed when other modes (Energy, Energy/Paper, or Paper) were selected (see below) are returned to their factory default states. This mode will support performance claims for the product. Includes all of the settings associated with Energy mode plus duplex printing is set as the device default (if equipped). Duplex printing is set as the device default (if equipped). The parameters that are changed when "On" is selected (see below) are returned to their factory default state. This mode will support performance claims for the product, and is intended for all document types. No supplies are required with the machine order. InfoPrint Color 1834 is shipped with 4,000-impressions3 black print cartridge and 4,000-impressions3 CMY print cartridges. Refer to the table below for replacement print cartridges. It is the customer's responsibility to order and maintain an adequate inventory of toner cartridges and maintenance supplies. 3 Approximate yield has been established with an average coverage of 5%. An impression is defined as one printed side of a sheet. A duplex sheet would consists of two impressions. ISO/IEC 19798 is a method for the determination of toner cartridge yield for color printers and multifunction devices. All maintenance supplies are customer installable. Installation services are available at InfoPrint Solutions Company's current billable service rate for this product, with a one-hour minimum. The maintenance kits must be purchased separately by the customer before contacting InfoPrint Solutions Company or installation. Supply warranties are only for defects in materials and workmanship at the time of shipment and installation. They are not for print count life or normal wear and tear, nor for any print count minimum. Contact your place of purchase for warranty return instructions. The pallet quantity for InfoPrint Color 1834 is eight printers per pallet. 4 All furniture products will have a one year (12 months) warranty with delivery of this warranty through replacement CRUs shipped direct to the customer for customer installation. After the one year warranty, repair or replacement of the furniture is customer responsibility.